"Our reputation rests on my success… You and I are explorers now." Another trailer for this epic adventure film before it hits theaters next month. 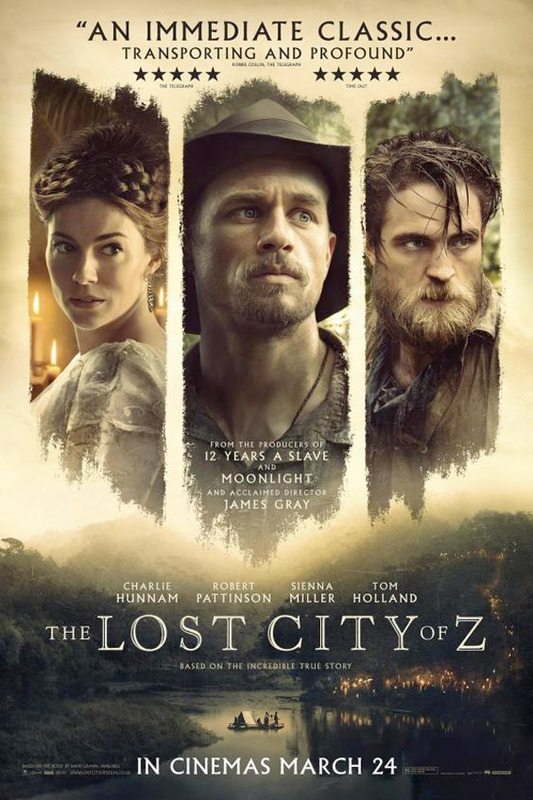 The Lost City of Z tells the true story of a British explorer who travels to the Amazon in South America in search of a rumored city of gold hidden in the jungle. Starring Charlie Hunnam as legendary British explorer Col. Percy Fawcett, along with Tom Holland as Jack Fawcett and Sienna Miller as Nina Fawcett. The cast includes Robert Pattinson, Angus Macfadyen, Daniel Huttlestone, Edward Ashley and Johann Myers. The film follows Fawcett on three different journeys to the Amazon, each with renewed hope that they may finally find this city. It already played at NYFF and Berlinale, but has been receiving divisive reviews. If you're into epic adventures, it's worth seeing. You can watch the latest US trailer for The Lost City of Z here, plus the first teaser trailer or full UK trailer. In 1925, Fawcett ventured into the Amazon to find an ancient civilization, hoping to make one of the most important discoveries in history. For centuries Europeans believed the world's largest jungle concealed the glittering kingdom of El Dorado. Thousands had died looking for it, leaving many scientists convinced that the Amazon was truly inimical to humans. But Fawcett, whose daring expeditions inspired Conan Doyle's The Lost World, had spent years building his scientific case. Captivating the imagination of millions round the globe, Fawcett embarked with his son, determined to prove that this ancient civilization existed. Then his expedition vanished. The Lost City of Z is both written and directed by British filmmaker James Gray, of Little Odessa, We Own the Night, Two Lovers and The Immigrant previously. Adapted from David Grann's book. It first premiered at the 2016 New York Film Festival. Amazon Studios + Bleecker Street opens The Lost City of Z in select theaters starting April 14th this spring, wide release April 21st.